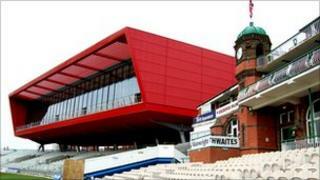 A High Court bid to block Lancashire County Cricket Club's plans to upgrade its Old Trafford ground has failed. Property company Derwent Holdings, owners of nearby White City retail park, sought a judicial review of planning permission given to the club. The club had warned any delay in implementing its £32m redevelopment plans could threaten its status as a venue for Ashes Test matches. A Derwent Holdings spokesman said the company would not be commenting. The High Court action was heard in Manchester last week. Lancashire chief executive Jim Cumbes, who had warned that the review's outcome would "make or break" the club, said: "This is a historic moment for Old Trafford, as it will ultimately secure the future of international cricket in Greater Manchester and the North West as well as enabling us to fulfil our promises to local schools and the local community at large. "This development has undergone every kind of scrutiny and delay possible and we have successfully cleared every hurdle put in front of us. "We can now turn our attention to the work that needs doing to enable us to submit our bid for an Ashes Test match in 2013. The redevelopment will see the capacity of the ground, which was opened in May 1857 and first staged Test cricket in 1884, increased to 15,000 by the addition of two new grandstands, with scope to rise to 25,000 with the use of temporary seating. The club had argued that the upgrade was vital for Old Trafford to be a Test Match venue for the 2013 Ashes Series against Australia.